Best price I've seen this game brand new. Game has had mixed reviews but it's surely worth a purchase at £18. This is surely going to be the first AAA on PS+. That is what i am holding out for anyway. Otherwise probably best going the used route at £14.99. This will be free on PS+ within 3 months imo. It's a pretty decent game, got the Knack bundle at the midnight release, it is actually quite challenging and the plat was hard to obtain. Very much a Crash Bandicoot platform style game. Good price, like jaystan mentions pre-owned is another option. It's also managed a 4.2 overall rating over 90 reviews on Amazon and as a release game I would say it has done well. Would this reflect in store too? I got a the platinum on this game and I enjoyed it. visually it aint great for current gen games, but it is quite good fun and gets very challenging on the difficult settings, very old skool type of game play. a lot of the reviews don't do it justice. but, its guaranteed to be on ps+ this year, so I would wait for that. I agree its gunna be on plus but if it doesn't end up on there then the price is only going to keep coming down anyway. I agree its gunna be on plus but if it doesn't end up on there then the … I agree its gunna be on plus but if it doesn't end up on there then the price is only going to keep coming down anyway. I would probably wait until it is £10 or less as it has been £15 on and off for at least three months in CEX and Grainger Games, so I am convinced that it could hit £10 new at some point during the Summer Sales. Perhaps Zavvi, Game or someone like that will just pop up with one of those surprise offers as part of their Summer Sale. I would probably wait until it is £10 or less as it has been £15 on and o … I would probably wait until it is £10 or less as it has been £15 on and off for at least three months in CEX and Grainger Games, so I am convinced that it could hit £10 new at some point during the Summer Sales. Perhaps Zavvi, Game or someone like that will just pop up with one of those surprise offers as part of their Summer Sale. Agreed completely. I can definitely see it going down to £10 used very soon (within the next month) probably at GAME or Grainger and then soon after ending up on PS+. I'll definitely give it a go for £10 new or used as it does look like a bit of a fun game. Agreed completely. I can definitely see it going down to £10 used very … Agreed completely. I can definitely see it going down to £10 used very soon (within the next month) probably at GAME or Grainger and then soon after ending up on PS+. I'll definitely give it a go for £10 new or used as it does look like a bit of a fun game. At the end of the day; if we have to wait until Christmas for it to go £10 or less then even then, so be it! 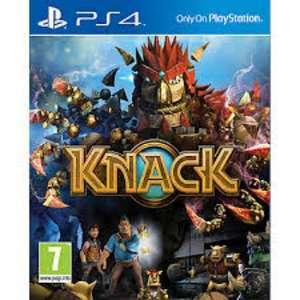 I am hoping to get some many cheaper games in the Summer Sales and Christmas Sales for PS4 and maybe in between one or two that will just naturally pop up at amazing prices, but I would be very surprised if Knack did not drop by another £5 and switch from pre-owned to new this Summer. The fact that stores, such as Tesco are even cutting the price will surely result in CEX and Grainger Games having to go cheaper due to not having as much of a cushion as the £20 or so that they had before on the pricing. This game is terrible but a good price. Like others I am going to wait for it to be free on PS+ but this a good price. I'm not sure if they still apply this rule but Sony supposedly only choose games for ps+ that have a rating of 70 and over on Metacritic. Knack only has a rating of 54. We really enjoyed it and played all the way through in about 4 days, recommended at this price. I played through this twice (you really need to if you want to unlock some of the items). Definitely worth £18 and certainly enjoyed it more than KillZone. I'm not sure if they still apply this rule but Sony supposedly only … I'm not sure if they still apply this rule but Sony supposedly only choose games for ps+ that have a rating of 70 and over on Metacritic. Knack only has a rating of 54. Dynasty Warriors Next wasn't first party. The score of 70+ on Metacritic thing went out the window a while back, especially with regards to the PS4 when they are only putting up games on day of release etc. Don't know why this isn't a fiver yet. Good price. I will buy it. dunno why but ever since I saw the demo pre ps4 console release I just thought this game looked pants. not voting just throwing my opinion out there for no good reason. Got this for 25 from Grainger brand new a few months ago and enjoyed it. Seriously underrated game. dunno why but ever since I saw the demo pre ps4 console release I just … dunno why but ever since I saw the demo pre ps4 console release I just thought this game looked pants. not voting just throwing my opinion out there for no good reason. I though exactly the same but with all the hype and big price tag I gave it the benefit of the doubt - but no its pants. The decimal place should move to between the 1 and the 8. Then I might be tempted. Does anyone else share my loathing of the PS+ offerings for PS4 thus far? I absolutely agree with you. A lot of people on this forum don't but I think it's either a question of taste or how much cheap crap people are willing to tolerate. I absolutely agree with you. A lot of people on this forum don't but I … I absolutely agree with you. A lot of people on this forum don't but I think it's either a question of taste or how much cheap crap people are willing to tolerate. Yeah, I do completely agree with you. I think the PS4 has been a bit of a disappointment in general so far and unfortunately it doesn't really have any decent exclusives to offer this year either apart from a full priced remake of a 1 year old last gen game. Yeah, I do completely agree with you. I think the PS4 has been a bit of a … Yeah, I do completely agree with you. I think the PS4 has been a bit of a disappointment in general so far and unfortunately it doesn't really have any decent exclusives to offer this year either apart from a full priced remake of a 1 year old last gen game. Yeah not played mine in weeks and will buy Last Of Us as PS3 was just an awful console so didn't really manage to play it last gen.
Yeah not played mine in weeks and will buy Last Of Us as PS3 was just an … Yeah not played mine in weeks and will buy Last Of Us as PS3 was just an awful console so didn't really manage to play it last gen. I preordered it because I got one of those cheap copies from 365. I'll probably play through the single player again and then trade it in. I hated the multiplayer the first time around so there's no chance that I would subject myself to that again. I think there's been a few good games released on ps plus. Resogun is still my favourite game on the console, Outlast is a good game and Don't Starve was addictive. It's understandable that we haven't had any AAA games so far as the console is only 8 months old. I think there's been a few good games released on ps plus. Resogun is … I think there's been a few good games released on ps plus. Resogun is still my favourite game on the console, Outlast is a good game and Don't Starve was addictive. It's understandable that we haven't had any AAA games so far as the console is only 8 months old. You've just mentioned 3 games from almost a year's worth of garbage. I don't really think it could be considering a complete success so far.